Wagner Electric specializes in Flagpole installations. 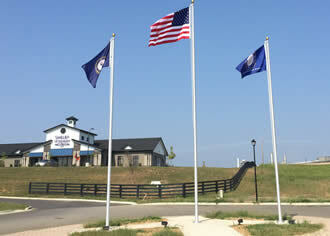 We can install any size pole and flag at your place of business or home. As an electrical contractor we also can provide you with lighting "OH GLORY" with some of the newest Led lighting that will Illuminate your new flag. We do installs for all of our local flag companies as well. To learn more about this service, give us a call at (502) 267-8384 or click here to request more information.